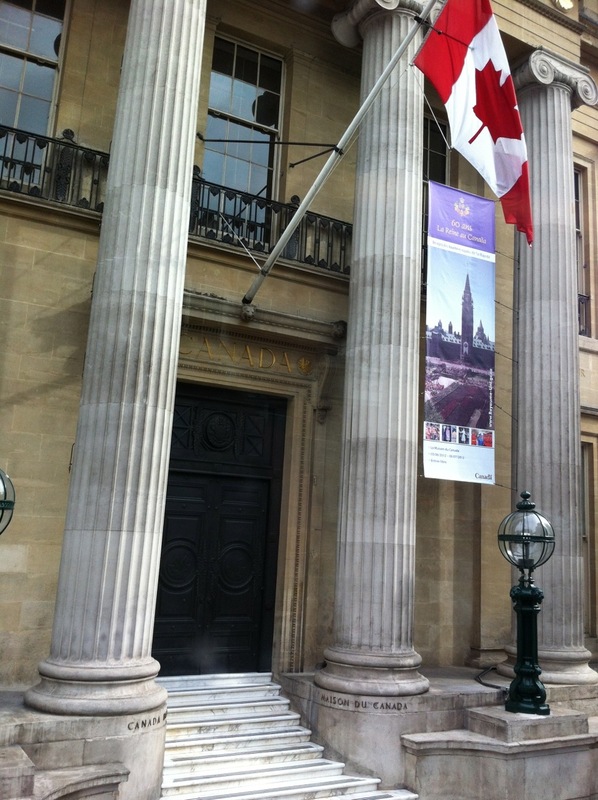 The latest report from our London Correspondent, Canoe Museum Executive Director James Raffan. The final step in the multilayered security clearances for pageant participants is to get “accredited” to be on the water. This can happen on the day of the pageant but organizers are urging everyone to go through this process before, if possible. Went down to the Strand Hotel, on the Strand … where else would it be? 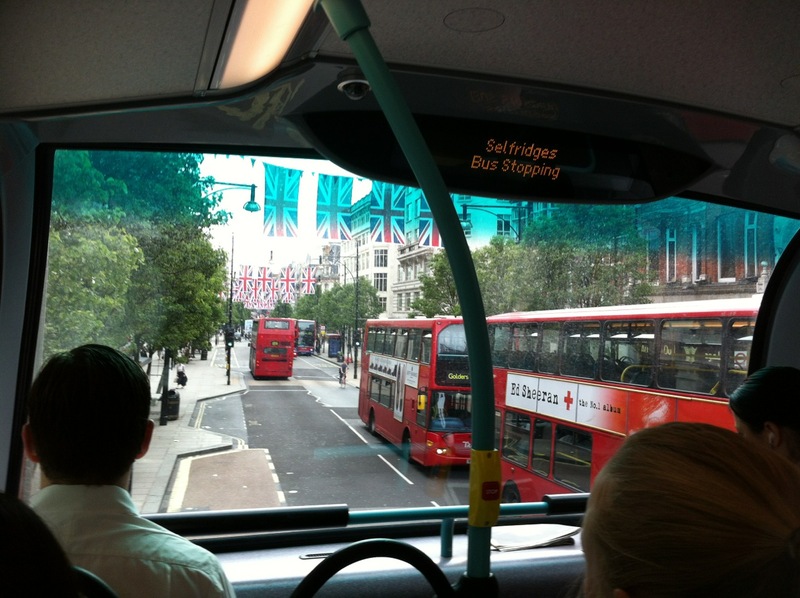 … to pick up the Canada One/Un boarding passes this morning by bus from Paddington. This town is getting totally electric … there are flags everywhere! And, with seriously congested traffic, there was lots of time on the upper bunk of the double decker bus to check it all out. 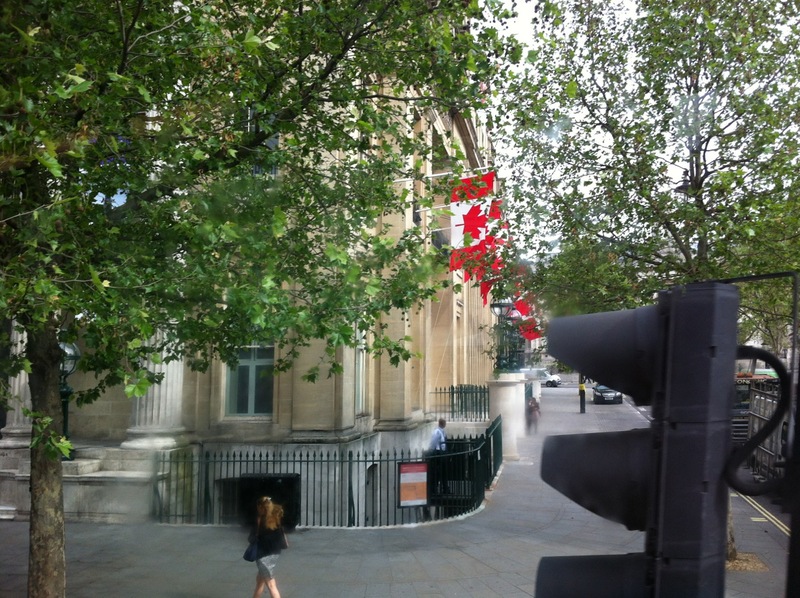 Along the way, I looked out and there was Canada House—The Canadian High Commission—at 1 Grosvenor Square and my heart went all a flutter with the sight of a few Canadian flags amongst all the Union Jacks. Got to the hotel and walked into a swanky meeting room where there was an L-shaped table with nine people, all dressed in pressed black clothes, sitting in front of neatly (and symmetrically) arranged laptop computers, anxious to starting accrediting pageant goers with a vengeance. It was a bit awkward, being early and the only customer for all these tellers, not wanting to offend anyone by going to their neighbor. Happily, one woman on the end of the line caught my eye and said hello, so I went to her and, sure enough, she produced all the boarding passes. These indicate that each individual team member has passed the security check and been approved to participate. But that’s just an intermediate step. 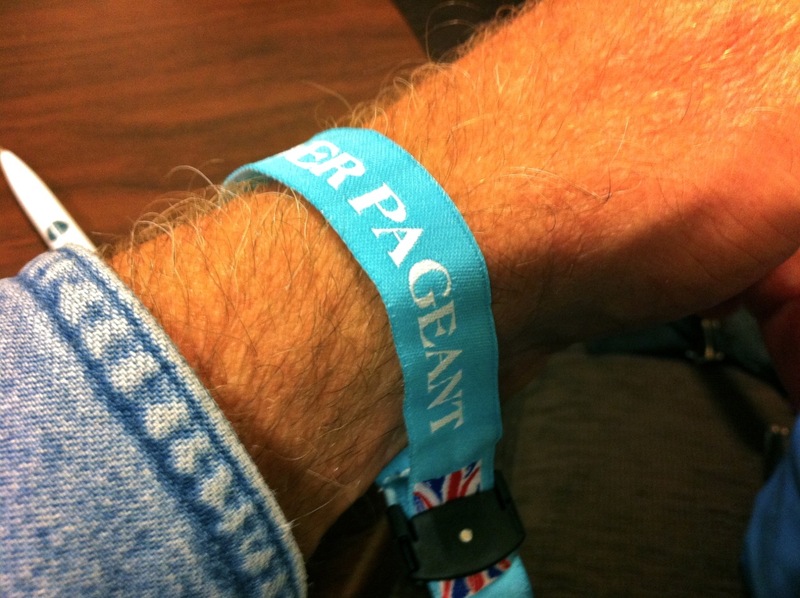 Individually (so I could only do this for myself this morning) I then had to go to another guy in the room, who checked my Boarding Pass against my passport and then he produced an official Thames Diamond Jubilee Pageant wrist band and put it on my arm. One down, seven to go with the accreditation process. The more people we can get pre-accredited the easier things will be at show time on Sunday. And we can pass the vessel scrutinization to get on the water at all until we’re all accredited so this is a huge step. Because this was near a part of the Thames I hadn’t checked out yet, I made my way to the nearest bridge (Waterloo) to check out the river. The commercial traffic is still chugging up and down, as are the police boats and London Port Authority vessels. 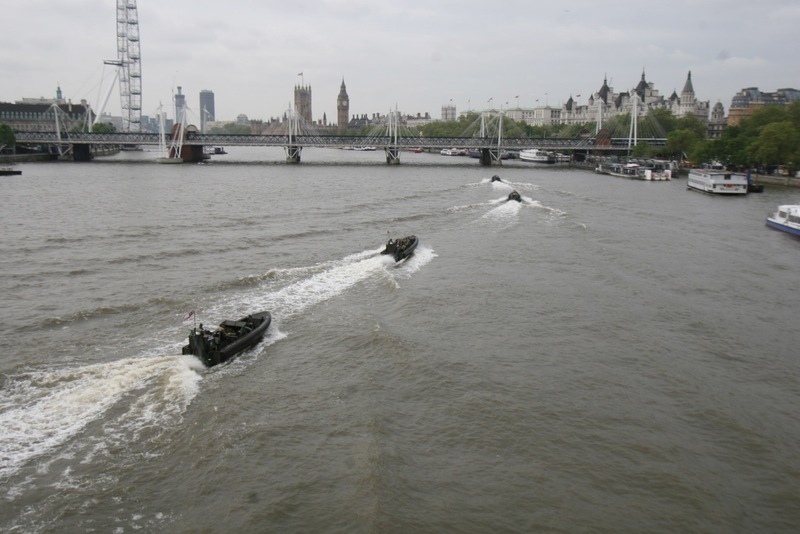 But what was new, in addition to the security choppers whacking away overhead were platoons of Royal Marines in green zodiacs patrolling the river banks. Anticipation is building. The security cordon is tightening. On Sunday, everyone is being warned, there will be bridge and road closures to limit access to the river and so we are to leave plenty of time to get to the put-in point. Could be a bit of a nightmare getting onto the water. Yup, that the other Big Ben (first in our hearts, of course, is Canada’s own four-legged equine star of the same name) in the background! This is looking upstream from Waterloo Bridge. On Sunday we’ll be coming the other way. And, as big as this Diamond Jubilee Party is going to be, it’s just the first of two massive public spectacles in London this summer. 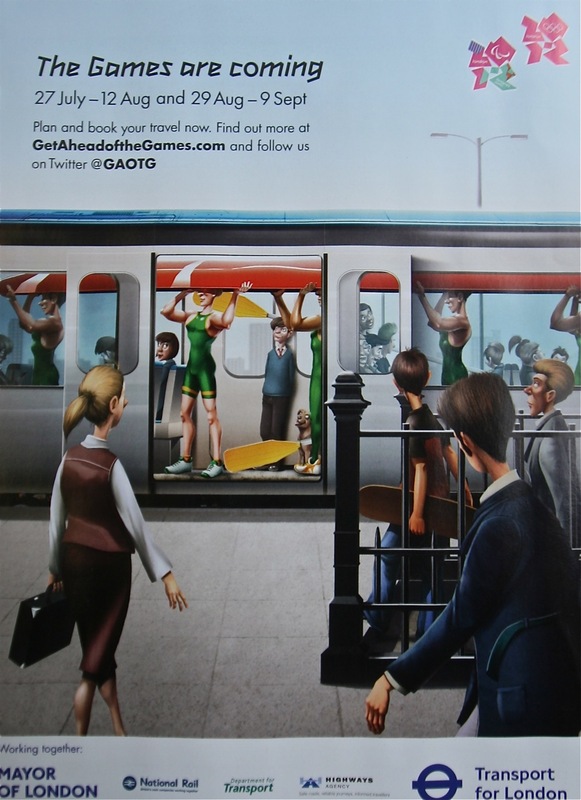 Very cool to see the Olympics being advertised in print here in London with a boating motif in the ads! Rest of the Canada One crew arrives tomorrow. Talking to Wei Chen on CBC’s regional program, Ontario Morning at 6:20 a.m.